The American savings crisis is a time-bomb, as multiple generations hurtle toward retirement with effectively no savings, and experts are now saying that having $1 million in the bank on retirement day isn’t enough. Future generations will either have to let their parents starve or compromise their own ability to produce the next generation while caring for the previous one (this is the crisis underway in China and Japan right now). What’s more, American savings are declining. Have Americans simply lost their moral fiber and with it the ability to control their impulses to recklessly buy 4K TVs and avocado toast? Or are there structural impediments to savings that are glaringly obvious in the data? Starting with the elimination of defined-benefits pensions in favor of stock-market-driven 401(k)s that ask naive investors to compete head to head with high-speed-trading Wall Street titans to eke gains out of the casino (if you can’t spot the sucker at the poker table, you’re the sucker). But then there’s the skyrocketing cost of housing, education and health-care (from 1972 to 2005 median American healthcare spending rose 74%, mortgages went up 76% and child care/college doubled). You can’t save money you’ve had to spend to shelter yourself, educate your children, and stave off early death from injury or illness. 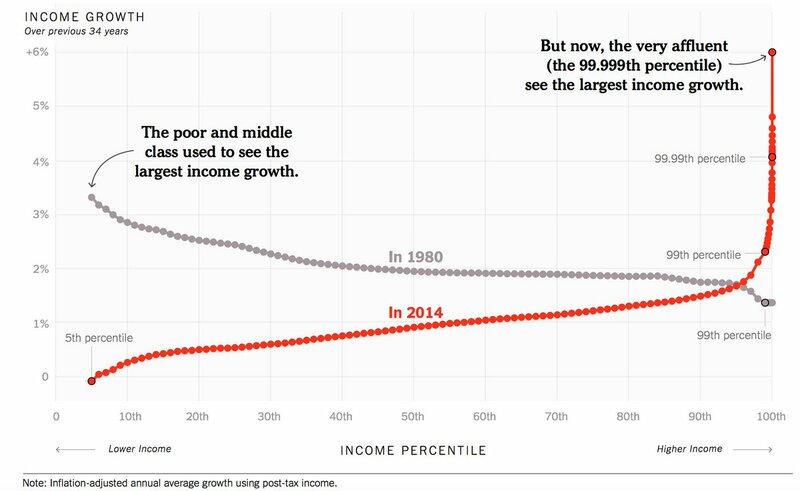 And then there’s the stagnation of wages: nearly all income growth since 1980 has accrued to the wealthy, whereas before that, it used to accrue to the middle classes. You can’t save money you don’t have. Finally, there’s interest rates: our grandparents bought Certificates of Deposit that paid out 11 or 12 percent over a six months or a year. Today, a five-year CD pays 0.86%. The Feds have been so terrified of inflation — and so excited by debt-fuelled GDP growth — that they’ve kept interest rates as low as 0%, and even engaged in a perverted love-affair with negative interest rates (that is, you have to pay the bank to hold onto your money!). So here we are, sitting on our time-bomb. The federal government can raise aggregate demand, either through direct public investment or by getting more money into consumers’ pockets through welfare state spending. But the conservative turn in American governance inaugurated by Ronald Reagan pulled way back on that. The Fed itself also went nuclear to fight inflation around 1980: It jacked interest rates into the stratosphere, causing a massive recession and a wipeout for the working class. Unions collapsed, we stopped raising the minimum wage, and we cut taxes on the wealthy. That meant a lot less money went to lower- and middle-class Americans, and a lot more went to the wealthy, where it sits uselessly in financial markets rather than being recycled into new economic activity. All those bad policy choices combined to create the conditions for a long die-off in interest rates. As you might have noticed, those were also the conditions for stagnant income growth. Perversely, a lot of economic policymakers praise this period for its low inflation, calling it the “Great Moderation.” A better name would be the “Great Permanent Semi-Slump.” Low inflationary pressure goes hand-in-hand with low wage growth and low interest rates. When you lay all that out, Americans’ terrible saving rate stops looking like such a mystery. In fact, it looks downright rational. After Digiconomist’s analysis of the total energy consumption of the Bitcoin transactions on the blockchain went viral, Timothy Lee at Ars Technica provides a much-needed reality check in the form of some technical detail and nuance about what that energy consumption means, and where it might go. This week, global finance criminals Morgan Stanley published a report warning investors that a victory for Jeremy Corbyn and the Labour Party would be worse for its fortunes than even the most shambolic, bungled Brexit (which the Tories are on track to deliver). Dissident economic statistician Matt Bruenig (previously) has parsed the latest numbers from the Survey of Consumer Finances, and brings us the news of the increased democratization of student debt: in 1989, only 16% of students and their families carried student debt — in 2016, it was 44%.